Fragments from ‘De Katholieke Universiteit in 1932-1933’. For the original text see: De Katholieke Universiteit in 1932-1933. See also comment by Corjo Jansen: titusbrandsmateksten.nl. Now the tenth year of our Catholic University is concluded, instinctively we do not only look back over the past year. Already ten years. Still we see the day of the joyful opening, on which the long-cherished ideal began to be realised. And all those images people used, in order to indicate that they harboured the greatest expectations for the opening of the Catholic University. 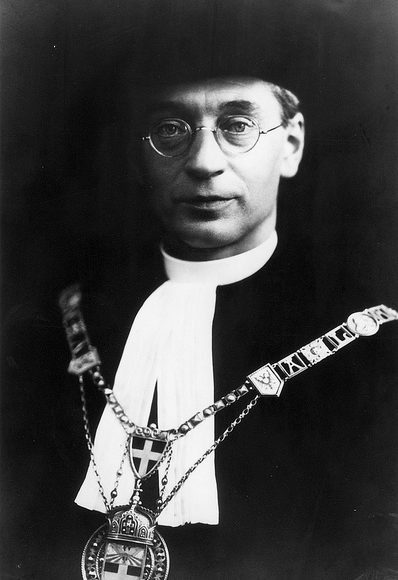 In one of the speeches about the founding of a Catholic University, I myself had the opportunity to recall the words which Le Sage ten Broek wrote, now nearly one hundred years ago for the accession to the throne of King Willem II: “That people allow us a free Catholic University…then after ten years we shall discuss this further” (Ned. Cath. Stemmen, 1840 p.381). Now, ten years have passed by. Today we shall discuss this further with each other. And hence, I think I can say that we are able to look back with much satisfaction on the years which have passed since the founding. Whether or not all the ideals have been fulfilled, and all expectations met. Yet, there will certainly be no-one amongst the Dutch Catholics, who for the flourishing of State and church takes an interest in the higher development of the growing younger generation, who does not gratefully recognise the blessings which the founding of this University has brought. In this hour, allow me to express just for a moment, feelings of joy and gratitude that, in referring to the words of Le Sage ten Broek, people have allowed us to establish our own University. After the first ten years we are better able to see the value of it, than we did when it was founded. We Dutch have continuously attached great value to the experience. We are not people of vain speculation and day-dreaming. And although at the founding of this University we had in mind many ideals and we trusted that we could achieve this, we feel ourselves to be much more relaxed, now that the facts are self-evident. The number that study here is greater than the greatest optimists, for ten years, dared to mention. People expected four hundred. In the most recent year there are 530. And yet, the number of theologians is smaller than people expected. Surely an indication that people should not complain too much. I can state with joy that gradually the number of students has become so great, that a lively well-organised student-life has been able to develop, and in all Faculties real academic life has been able to reveal itself. Moreover, this is something to rejoice about, because this higher number of students does not find its base in being able to obtain an academic degree more easily here than elsewhere. People outside of our circles certainly surmised and expected this in the beginning. The result has shown that from the very start, people with responsibility have lived with the clear awareness that when the Catholics found their own University, they would always see it as their duty to comply with the highest demands. This is not something which is decreed out of a small circle. From the very beginning, people have recognised that Nijmegen was up to the mark and did everything not to suppress the high level on which Dutch higher education stands, but to contribute to maintaining it at this high level. Sometimes people have said and even openly written, that Nijmegen devotes more than enough care to this and in all faculties, sets the standards so high, that people at the State Universities achieve an academic degree more easily and quickly. It would be unjust if Nijmegen went too far in this and consequently discouraged students who belong here. Within reasonable limits it is nevertheless gratifying that people in Nijmegen set the standards high and that, overall in university circles, it is recognised that in Nijmegen the required standards safeguard a high level of academic education. This reflects well on the University. Meanwhile it warrants attention to ascertain how many students, who might be expected to study in Nijmegen, turn away and what the reasons actually are for this. It is sometimes said of this that Nijmegen demands a high standard, yet one is kindly asked to make a distinction here between that which is said and that which, in actual fact, might be assumed to be the reason. It does not fit for me, and I also do not feel inclined to bring to the attention of my highly esteemed colleagues what might be the less desired consequences of all too high stated demands. I certainly consider it to be an on-going duty, to those who advance this reason for their staying away from our University, to draw attention to the fact that because of hardly convincing objections, they not only deprive themselves of great intellectual goods, but through their example easily get others on their side, who without that example would have found a way around those objections. Assuming for a moment, and without yet surrendering to it, that the objections actually have some basis, then the countering of the greater difficulties is regarded as a serious objection only for a very few, for on the contrary, for the vast majority it will still be an advantage. It goes without saying that I cannot go into more specific details about this here. In the last ten years of its existence, the Catholic University has gained an honourable name for itself through the demands which it places on obtaining its degrees. It may also rejoice that recognition and distinction have been conferred on its Professors, and in the circles of Professors and scholars they are received and hailed with appreciation. The gladly accepted co-operation with them, warmly spoken about on the opening day by the Rector magnificus of Leiden Prof. Krabbe on behalf of all Universities, and in the ten years which now lie behind us, are reinforced and affirmed by the always favourable and appreciative attitude of our colleagues at the State Universities and High Schools. I may repeat what the first Rector Mgr. Schrijnen said of the opening of the University: the representatives of learning on a neutral and positive, religious foundation, approach each other more closely than ever before. The result has shown that through the founding of the Catholic University, the catholic scholars of learning have been brought into much closer co-operation with the scholars in the non-catholic camp, than would have been conceivable without this foundation. This is for us Catholics advantage which cannot be appreciated enough, but also, we may call it an advantage for the pursuance of learning in general, and thus it is also more and more recognised in non-catholic circles. In the country there is too much spoken about the students of Nijmegen that in this speech, I am unable to keep silent about them. Sad to say, the attitude and the remarks of some have cast a slur on all, which fortunately they do not deserve. Quite simply, there is in this time of radicalism and integralism a movement in the world which also in the catholic camp, at least for some time, has carried many along in an atmosphere of on the one hand, a pessimistic looking down on life in the church, not least on the clergy, on the other hand, of an optimistic demand for perfect perception of the Christian ideal. For both points of view there is a basis. They are like two movements which flow into each other. In the long term, as both equally deepen, they fuse with each other and the optimism tempers the pessimism and vice-versa. But with the first powerful rise of either, out of a basis of different composition, they continue to move for some time unharmoniously and unconnected next to each other, without a synthesis of opposites taking place. In its first ascent this movement was too superficial, in order in the long term to be able to fulfil and satisfy people who are searching for a deeper insight. I will not deny that this movement has found for a while some adherents among the students of Nijmegen, actually rather too many. I consider that from the one side, for young people, this is completely understandable and, although not yet balanced, is partly even an indication of love and enthusiasm for the sake of the good, and from the other side, although it is to be regretted, it is not in the least dangerous or worrying. If I consider the whole for me the Nijmegen student is too good and too reasonable, too earnestly seeking after the truth and the good, that I should fear that this all too superficial stream would be able to carry them with it for any distance. They may for a moment mess about in that water, but as soon as they arrive at the experience that it is not possible to dive deeper in that water and it offers no prospect for swimming forward, they shall soon leave that wading around to others, who from such a superficial and less thoughtful business, experience a mischievous diversion and worse. I will not deny that over the course of this year, students of Nijmegen – I actually blush a little so to name them - have issued statements a few times which have awakened outrage in the country and from more than one side the Rector magnificus, who keeps watch over discipline, has received objections and demands to intervene. With high appreciation of the feelings which inspired the protests, with the recognition that there was some basis for this, I determined nonetheless, in discussion with the Board of Assessors and the Secretary of the Senate, not to proceed to sensational regulations of defence or punishment, because appearance triumphed over reality, and I restricted myself to some stern words, which were responded to by promises of no repetition and better insight. With the most disappointing utterances of very few, recorded in a tactless manner in the student magazine, I have written in this magazine that I repudiate the therein recorded statements, written down during lectures, as notions which might live in our student community and to my joy, consider myself qualified to state that similar statements are an irritation to the overwhelming majority of students of the Catholic University, and that in general they do not wish for a repeat of similar attacks, a fortiori not in the ‘Vox Carolina’. In a student magazine a as far I know non-Nijmegen student, has called this statement of the Rector naïve. My contact with ‘the mischief makers’ gives me reason to repeat it and to have full trust in it, over and against the feelings of one, who through what he has written, appears to view the case very superficially. I would have preferred to have seen that this movement of radical integralism had not disturbed our student circles and even better, that these would have turned out to be unresponsive to the disturbance, but people can also desire too much and I myself can well explain that this movement, just for a moment here, carried along kindred but nobler disposed spirits. I myself am hardly concerned about this. I have enough confidence in the Nijmegen student community, that I dare to declare that the spirit which lives there and grows in strength, is good, one which gives courage for the future and fosters the finest expectations of our young students. The number of students increases. From the 189 who were enrolled here in the first year, that number has climbed this year to 531. People had reckoned on 150 for the first year and 400 for the later years. The first Rector was already able to speak of surpassed expectations. We do it again. I do it in the ordinary sense. There are some, who see this number increasing with a certain trepidation. In a number of rectorial farewell addresses of the previous year, concern was expressed about the increase in the number of students. Perhaps that concern resonates here and there at the present time. The Government has even intended to put in place a statutory measure to bind people from abroad to restricted conditions in order to access our Universities. People speak of the cultivation of an intellectual proletariat, of a squandering of intellectual goods and I know not what kind of strong and great words people use. I might be permitted to strike a rather different tone in this general lamentation. I admit that there are many in the country, and because of education increasingly more to come, who are in the position to do something more than what they are presently able to attain; that there is so much latent potential energy amongst the Dutch people. I would gladly see all of these many people assigned a place in society which meets their development, but in all companies from high to low there is unemployment and people cannot expect that an abundance of work can be made available to the intellectually educated. I would view it as a disaster for society if, because of a certain avoidance of material work for the necessary rougher work for which no schooling is necessary, a shortage of available workers should exist, respectable manual work would become discredited, but where thousands of hands are keenly reaching out to this work but to no avail, I cannot view it as a disaster that at least through schooling, intellectual goods are obtained for humanity. The necessary consequences of this will be that people, for the differentiated societal work activities, do not need to be satisfied with a minimum of schooling but can make higher demands on the workforce, and that in this way societal activities can be performed to a higher level by employees. To a large extent this serves to refine and strengthen the power of people. The general level of development is brought to a higher standard and the war has shown how higher development can make a people strong above its number. A higher level of development will also benefit the Netherlands in difficult times, and not necessarily that of war. It cannot be otherwise then [that] society benefits in very many respects when the differentiated work activities are performed by people who are more than ready for them and, if need be, could do something more than they have to do at that moment in time. In the beginning, in a time of transition, this will make a group disheartened and nearly desperate because they are unable to find work which fits with their idea of development, but gradually they will set lower demands and be satisfied with less work and with the thereby corresponding smaller remuneration. This must, as a matter of course, lead to a greater retrenchment in the way of life of the intellectual circles, of which we fortunately already see the first signs. Higher development need not merely be thought of as the guarantee of easier material existence and as a way to more material enjoyment; it is a good in itself which gifts goods from a higher order on those who possess it, and see a gift and a privilege in that possession, which sets them above others with whom they perhaps are required to perform the same material work. And therefore, I doubly regret in this time of unemployment, that with the eye thereby directed to this, the development of the people is cutback to a disproportionate extent and that where the State provides work to so many, the intellectual powers are systematically eliminated from this work-provision, whilst the times could be so favourable, in order that the countless many intellectuals could perform highly useful work for society. Nevertheless, let us be cautious and not reject the cultural goods offered to us, thereby blocking-up the sources out of which true well-being springs forth. I also then, do not on the whole fear the great onrush to our University, greater than was expected. I applaud that, because it gives me the assurance that with this, the vitality and the energy of our Catholic population will grow to a great degree. During this year, much undeserved honour has been bestowed on me, because I was the Rector of the Catholic University of Nijmegen. That word has a good ring to it. I rejoice over that, especially on this day, now that I may hand over the rectorship to you, Greatly esteemed Colleague van der Heijden. This honour befits you more than me. I myself rejoice that through this office, your standing in the country, already so great, will continue to increase, will give you the opportunity to use your many gifts, your shrewd discretion, your clear insight and above all your love for the Catholic cause, in the service of the leadership of our University. Your governance will bring forth beautiful fruits. As Rector thou art privileged to lead the tenth anniversary celebrations of the University. Thou beginneth your Rectorship with a celebration. May this spirit of joy and satisfaction over what has been achieved, not only animate the hope of further progress, but may it also be granted to you to find and walk the ways which lead to this. Under the invocation of Mary, Sedes Sapientiae, in mediation of God’s Blessing, I hand over to You with the chain, office and dignity. Salve, Rector magnifice, iterumque salve.